On 'Fanfare For The Common Man,' An Anthem For The American Century Written in the thick of WWII, Aaron Copland's piece seems to have hope woven between its notes. Mandalit del Barco asks why so many who hear it, from presidents to prog rockers, are still so moved. 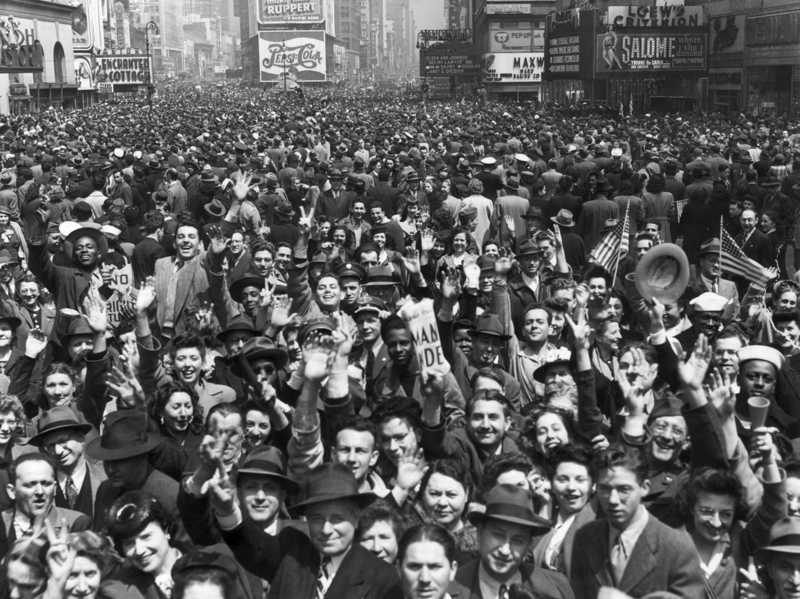 An enormous New York crowd celebrates VE Day at the end of WWII. Aaron Copland was inspired to write his "Fanfare for the Common Man" by a wartime speech rallying Americans against imperialism. Aaron Copland's "Fanfare for the Common Man" begins with dramatic percussion, heralding something big and exciting. Then comes a ladder of simple trumpet notes, solemn and heroic. The whole piece takes less than four minutes to play, but its admirers say it speaks volumes in that time. "It's a piece that feels like it was written by God," says jazz trumpeter and composer Terence Blanchard. "Whenever I hear it, it stops me in my tracks and makes me reflect on the goodness of man. And I know that sounds corny for some, but it really makes me think about [how], at the end of the day, most people in this country are good, God-fearing people. Honestly, that could have been our national anthem." Marin Alsop leads the São Paulo Symphony Orchestra in the opening section of Copland's "Fanfare for the Common Man" in 2012. In 1942, Copland was commissioned by the music director of the Cincinnati Symphony Orchestra to write a fanfare. The U.S. had entered World War II, and then-Vice President Henry A. Wallace was trying to rally Americans against imperialism. Copland was inspired by a speech Wallace gave that spring at the Free World Association in New York City. "Some have spoken of the American Century," Wallace proclaimed. "I say that the century on which we are entering, the century which will come out of this war, can be and must be the century of the common man." Copland would later echo that sentiment himself, saying, "It was the common man, after all, who was doing all the dirty work in the war and the army. He deserved a fanfare." "Fanfare for the Common Man" premiered on March 12, 1943, in observance of income tax time — something every "common man" has to endure. Since then, it has been performed for presidents, played to honor victims at the opening of the National September 11 Memorial & Museum and lent a sense of gravity to television sports and news programs. It's even been heard in space: In 2008, NASA pilot Eric Boe chose it as wake-up music for his crew of astronauts on the space shuttle Endeavor. "What it made me think about is that, holy cow, I'm in space!" recalls Boe, who first heard the fanfare when he was studying at the Air Force Academy. He calls it magical, like his voyages above the globe: "You're going around the planet once every 90 minutes, and just looking at the Earth and how beautiful it is and the thin layer that we call the atmosphere that's protecting the planet — and then hearing this great music that goes with what's going on down below." Back on Earth, Bob Dylan and The Rolling Stones have used the piece to open their concerts and British progressive rockers Emerson, Lake & Palmer went a step further and came up with their own version — which drummer Carl Palmer, the only living member, still plays at shows. Palmer says bandleader and keyboard player Keith Emerson once met with Aaron Copland in Switzerland and played him a bit of their version to ask for the composer's blessing. "We were a little bit worried about playing him the actual rock section of it where we were ad-libbing and having some fun," Palmer says. "And he thought it was OK! ... He said, 'At least you've done something different with it — that works for me. Go ahead, guys, I wish you the best of luck with it.' "
"Fanfare for the Common Man" has also been an inspiration to other composers, including Joan Tower, who started writing what became a series of fanfares in 1986. She wrote her "Fanfare for the Uncommon Woman" to honor women in the classical music world, including conductor and NPR contributor Marin Alsop. Tower explains, " 'Uncommon woman' actually means a woman who's adventurous and takes risks." But it is Copland's original fanfare that has become a kind of national anthem for so-called "common" men and women — like public radio listener Lynne Gilbert, who spoke with NPR from Bristol, Maine. "In spite of the current political landscape," she says, "I guess I still believe that there is an American dream of peace and prosperity for everyone. Music that soars and inspires like this piece does bring hope for the future. It's powerful, it's direct and it's really just American." In a previous version of this story, the first name of the listener who submitted "Fanfare for the Common Man" for the series was misspelled as Lynn. Her name is Lynne Gilbert.